Ladies and gentlemen open your wallets — and start your smartphones. The holiday shopping season is upon is. This year more than ever there are scores of sites, apps and online tools to direct you to the right product at the best price. It can all be a bit overwhelming in fact. Below I’ve tried to highlight some resources that may be helpful as you search for gifts over the long weekend and beyond. But before we get started let me first ask the naming gods to next year revisit and banish “Cyber Monday” from the tech lexicon — or dare I say “texicon.” And maybe we need yet a third day (or at least third phrase) after Black Friday and Cyber Monday to acknowledge the role that mobile shopping is starting to play in the whole process. Of course all the search engines have shopping sites. Yahoo offers a wealth of resources including a holiday gift buying guide and Black Friday/Cyber Monday deals guide. As part of that you get all the “newspaper circular” ads being distributed this week that show Black Friday deals in stores. There’s also a dedicated Deals area on Yahoo Shopping. Bing Shopping doesn’t have quite the same breadth as Yahoo or the Black Friday deals information but it has a helpful holiday gift guide for those looking for gift-buying inspiration. Bing is also a very good shopping engine. 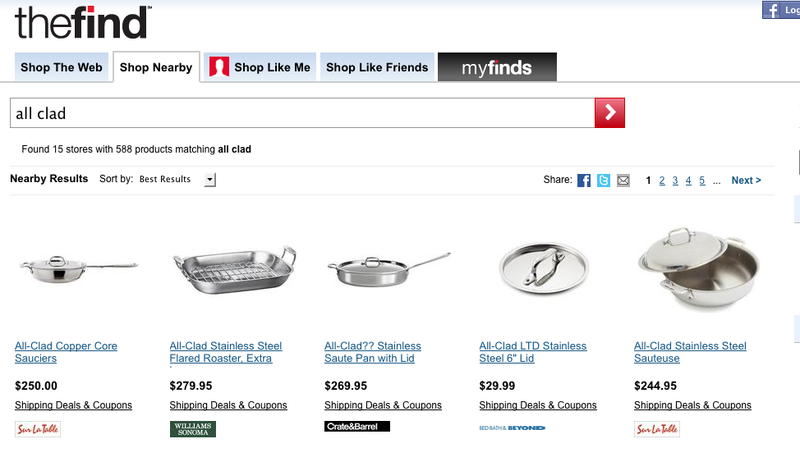 Google Product Search/Shopping is the most “no frills” of the three. However, as of last week, it can show you local stores that carry the desired item and whether it’s in stock — helpful for those who need it now or don’t want to buy it online. In the female apparel category, Google now also offers the un-Googly Boutiques.com. It joins a growing list of “social shopping” sites targeting women, which include Kaboodle, StyleHive, Polyvore and quite a few others. Ask and AOL offer shopping sites as well. 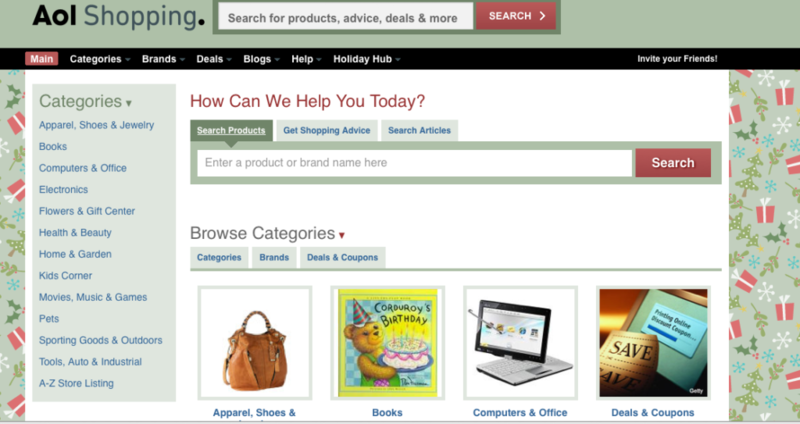 Ask’s site is powered by parent IAC’s shopping engine Pronto, which offers a better experience than Ask itself. I hadn’t been to AOL Shopping in a very long time and was pleasantly surprised to see all the content and resources there, including deals, hot lists and buying guides. Amazon is far and away the king of online shopping. The company has two mobile shopping apps, including the useful new Price Check, for in-store product and price comparisons. Earlier this year Amazon announced that it would process a staggering $1 billion in mobile orders. EBay is the other US company that’s doing a huge mobile business. I’m not a fan of eBay but it has lots of holiday shopping resources, including daily deals. I’ve already mentioned Pronto above. But the old, familiar comparison engines are there to offer price checks and reviews and deals (in some cases). Although useful most of the sites in this category are pretty tired and feature “generic” and largely undifferentiated experiences. That includes Shopping.com, PriceGrabber, Nextag, Shopzilla and others. Standouts in this category include TheFind (which has good mobile apps too). 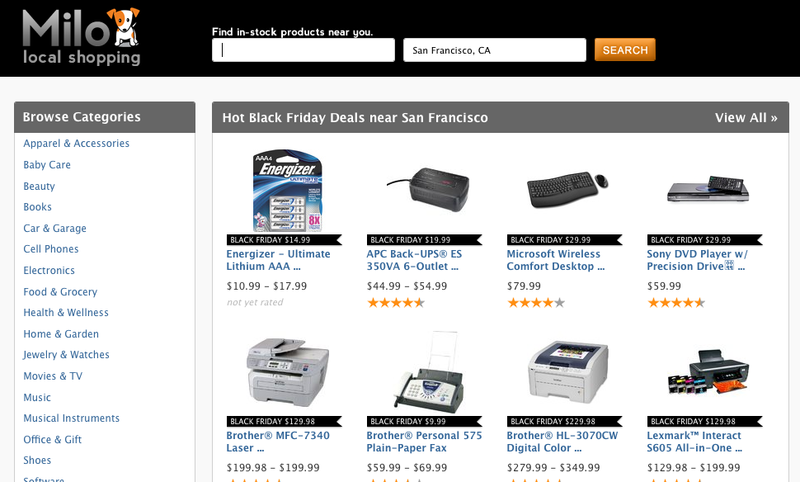 And of course Overstock.com is another very popular site. Become.com also has a special Black Friday section. As mentioned Yahoo and eBay have deals areas that offer substantial discounts on products. However coupons and deals, it seems, are everywhere this year. The recession has caused this but Groupon‘s success is also partly responsible for spawning a cottage industry. It was only a couple of years ago when online deals and coupons meant bait and switch. You were lured to sites only to discover that the promised deal wasn’t there. Now it’s almost impossible to list all the deal sites online. There are well over 100 daily deal sites now operating in the US. There are a growing number of sites that help consumers find products in local stores, offline. Google is making a big push into this area, as mentioned. And Goodzer just launched for New York this morning. And I just discovered another local product inventory site called LuckyLocal.com. Milo wants to be the Google of local products, although Google is now trying to be the Google of local products. Milo allows users to search for and locate in-stock product inventory nearby. There’s also a Black Friday area on the site. NearbyNow powers third party mobile apps that offer local product inventory. And so do Krillion and Retailigence. 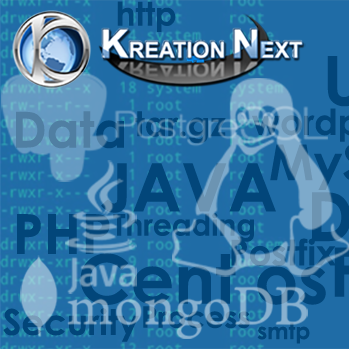 However, you can search and shop directly on Krillion where you cannot on the other two. Along the same lines, these days ShopLocal is less a consumer destination than it used to be; it has become more of a marketing platform for retailers. However you can still access all the major retailer sales, products and Black Friday promotions on the site, as well as other types of coupons. TheFind also offers a “shop nearby” feature that shows retailers that carry the desired product. The number of shopping apps for smartphones is proliferating like mushrooms in a field after a heavy rain. All of the major search engines and shopping comparison sites offer mobile apps for the iPhone, and Android in most cases. Bing does not currently have a specialized shopping app or tool. You can access Bing Shopping from a mobile browser however. Most major retailers (e.g., Target, Gap) have mobile shopping apps that can be used to find stores, check products and see what’s on sale. 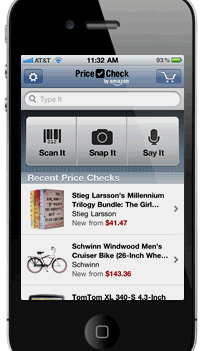 As previously discussed, Amazon and eBay have mobile apps. Amazon’s new Price Check app is very user friendly and helpful for in-store review and price comparisons, which is the information (reviews, pricing) that most consumers are looking for from mobile shopping apps. TGI Black Friday is a popular app for both the iPhone and Android, although the query “Black Friday” returns at least 20 apps on the iPhone. Google Shopper (only for Android) is much more user-friendly than accessing Google Product Search through the mobile web. It also has local product inventory data, voice search and image and barcode scanning. Speaking of which, there are more than a dozen stand-alone barcode scanning apps that can be used in stores (although retailers don’t like it). Two of the most popular are RedLaser and Scanbuy. The dirty secret of barcode scanning is that it often doesn’t work. That’s why it’s good to use an app that allows for multiple input methods, such as Price Check or Google Shopper or TheFind. Finally, Foursquare, Shopkick, Gowalla, Yelp and several others reward users with deals and discounts for checking in at physical stores and local businesses. This isn’t Black Friday/Cyber Monday centric but there are retailers that are using these sites (especially ShopKick and Foursquare) for promotions. 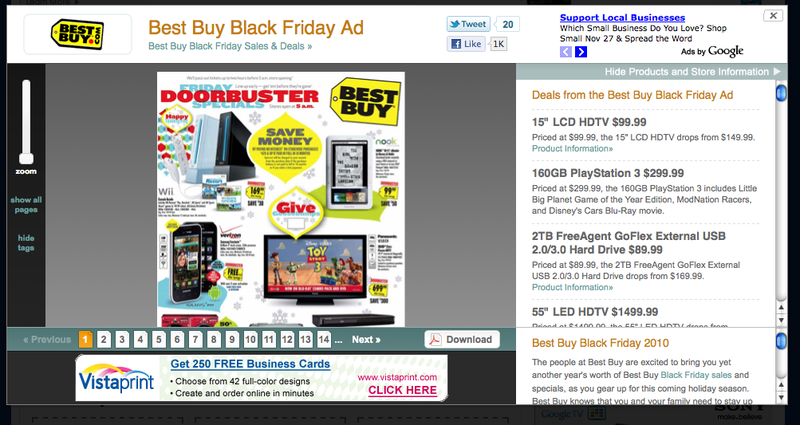 More for Black Friday / Cyber Monday tips, also see here on Techmeme. Happy Thanksgiving and may the shopping force be with you.